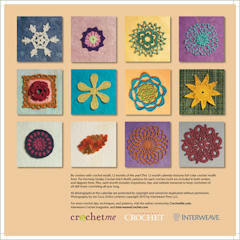 Just before Crochet Uncut was ready to be published, I received a copy of the Interweave 2011 Crochet Wall Calendar. The calendar features 12 motifs from The Harmony Guides: Crochet Stitch Motifs. Each month has a different motif which includes a large photograph of the motif along with both written instructions and symbol crochet diagrams. Each month also includes a tip, inspirational message, or website link to inspire you as you crochet or go about your day. I’m a sucker for wall calendars as they allow me to keep things straight without having to worry about the cat knocking it off the desk and the dog eating it (he believes that all paper is a chew toy). 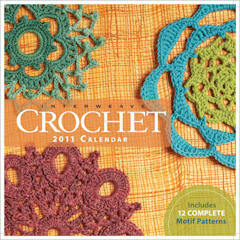 In addition to the crochet calendar, Interweave has calendars available for knitting, weaving, and spinning.